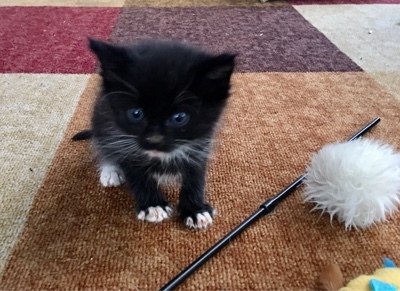 Anakin The Two Legged Cat: We have kittens! 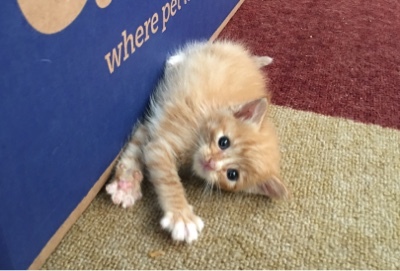 We have kittens! Not me exactly but my mom ( Anakin's Grandma ). She's had them for a little over a week. Our vet thinks they are now about 5 weeks old. 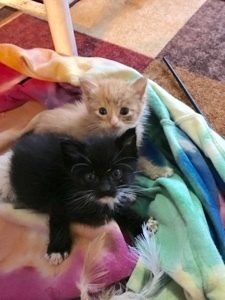 They are doing great & are named Bo ( orange ) & Luke ( black & white ). They are so cute & I'll be taking care of them for the next week or so & I'll post more pics & videos. Short Backstory - Their mom was someone's outside cat & was hit by a car & died. The kittens didn't have anyone to take care of them. They had 2 siblings that went to homes before my mom got there. We don't know who got them, where they are or how they are doing. I hope they are doing as well as these two. Wow, are Bo and Luke adorable! That's terrible about their mom, but glad these two are in your good hands! Thank you Maria. I know it's so sad. What cuties! I'm so glad your mother took them in. Thank you Summer. Me too. Carrie, they are absolutely adorable. So glad your mom was willing to take them since we know they will have a loving home. Luke looks exactly like a kitten I had years ago that was named Prometheus!! Are you keeping them separated from your "babies"? Thanks for sharing them with us. Thank you Sandy. Me too. Aww Prometheus is a great name! Yes, they will not be having any physical contact with my cats. Since they aren't staying here I don't want to upset mine too much. My mom just needs so help with them for a week or so while they are still so little. Hi from Chicago Bo and Luke...Handsome little dudes.